Heading into the All-Star break the Yankees were in need of a serious winning stretch to keep their playoff hopes alive. Over the next 28 games they got that stretch going 20-8 by outslugging their opponents 214 to 138. That outcome wasn’t exactly unlikely because the teams they faced were all sub-.500 teams and many considered the next 20 games against playoff contenders more important. This tougher schedule meant that they could not simply over power teams with their offense as they had been doing – they would need more. Lately they are getting what they need in the form of a stronger more balanced bullpen. Their new advantage became apparent this weekend when the bomber pen threw 11 innings while striking out 14 and giving up only a single run. It seems that the balance is working for them. In the past they almost exclusively ran out guys with high velocity fastballs and average breaking balls. Talented pitchers for sure, but the similar styles may have been exploited. On August 7th Joba Chamberlain was brought up and the bullpen received a facelift. With Joba’s heat, Edwar Ramirez’s change-up, and Luis Vizcaino’s slider playing a larger roll, the pen is more versatile. Instead of relying on Farnsworth he is now just a supporting cast member helping the team out when he can. The highlight is unquestionably Joba who, in 5 appearances, has pitched 7 innings while not allowing a run and striking out 11 all while reaching up to 99-MPH on the radar-gun. 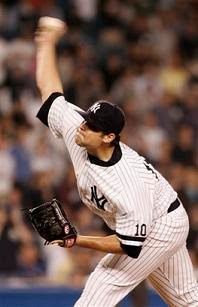 “I can't remember in my experience anybody like him, not only the fact that he throws hard, but the fact he can make pitches," manager Joe Torre said in the Journal News. In stark contrast is Ramirez who baffles hitters with his soft 78-MPH change-up which is better than most. In just 5 appearances this season he has struck out the side twice. "See, this is what we've been missing here. Nothing against Bruney, Proctor and those guys we had doing that job, except they all had the same look,” said Torre in the NY Daily News. Using the two pitchers Joba and Edwar back-to-back seemed very effective against the Tigers on Sunday. Chamberlain came in and overpowered hitters then he received a perfect complement when Ramirez came in and struck out the side keeping batters way out in front with his slow change. Hopefully it is a combination Torre will stick with in the future.